Reading though the The Essential New York Times Cookbook is like going back through the years in a time machine. I imagine it’s the same way for many faithful New York Times readers. Lovingly edited by Amanda Hesser, it’s packed with recipes that bring back memories. But there are so many, you can easily miss old favorites as your work your way through the pages. And that’s what happened to me. It wasn’t until Hesser resurrected David Eyre’s Pancake on her blog, food52, that I actually took notice and realized how much I missed it. 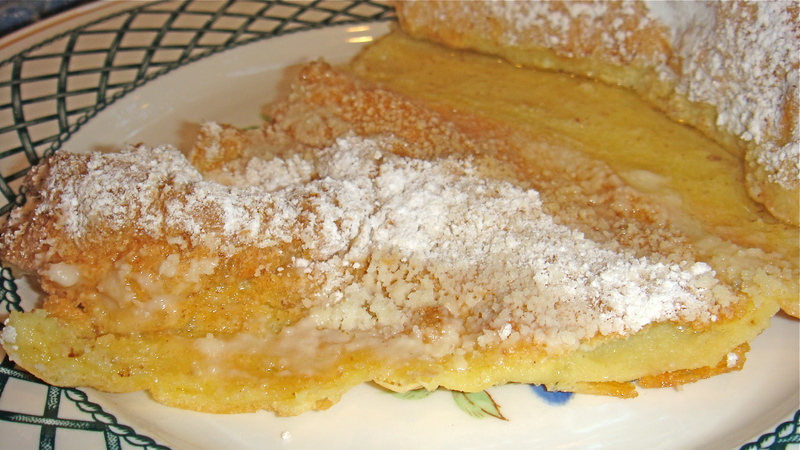 It’s part pancake, part crepe, tender, poufy and delicious. I had a hand written copy of it in my recipe box from decades ago. How many years had it been since I last made it? I knew it had to be at least eight or nine because that’s how long it’s been since I’ve been eating gluten-free. I was suddenly craving it again. Lucky me: David Eyre’s pancake has few ingredients and is incredibly simply to make. I converted it to gluten-free by using my all purpose brown rice flour mix. It didn’t need the xanthan gum; I had tested to see if it was better with it, but it wasn’t. The original recipe warns against over-mixing, but you don’t have to worry about that with gluten-free flour. I also added a quarter teaspoon pure vanilla extract to mask the lack of wheat and reduced the butter to three tablespoons from four (because after making it several times, I found that I could get away with less). The recipe calls for a squeeze of fresh lemon over the top of the pancake once you take it out of the oven. But sous chef boy (my 17 year old son, Bradford) didn’t like the lemon. I did. So you choose. Oh yes, and one more thing. The original recipe says it serves 2 to 4. I think they were joking and that it should really read: Serves 2 normal people, 4 very small people who don’t like to eat, or 1 sous chef boy. Preheat oven to 425ºF and position rack in center of oven. Lightly whisk eggs in a medium sized mixing bowl. Add brown rice flour mix, milk, vanilla, and nutmeg; mix until well blended. Melt the butter in a 12-inch skillet with an oven-proof handle over medium high heat. When butter is very hot, but not brown, add pancake batter. 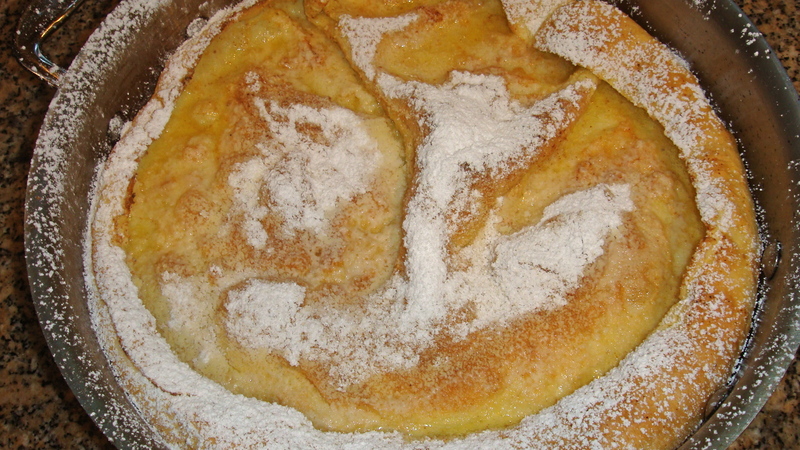 Bake in the oven for 18 to 20 minutes until the pancake has puffed up, the edges are billowing and it is golden brown. Remove skillet from of the oven and sprinkle the pancake with the sugar. Return it to the oven for 1 to 2 minutes more. Sprinkle with the lemon juice and serve with jam or preserves. *Find my Brown Rice Flour Mix in the Guide to Flour Mix section of this blog. Ok, this is something I have to try ASAP. Thanks! Annalise, I love this recipe, in fact it is in the oven rigt now. Can hardly wait for your new book. So glad you like it! I really love it, too. Fast, easy, and gone in seconds. No need to worry about what to do with those pesky leftovers! Happy New Year to you Joan!